This low carb yogurt is a breeze to make, super creamy and has only 2g net carbs per serving. 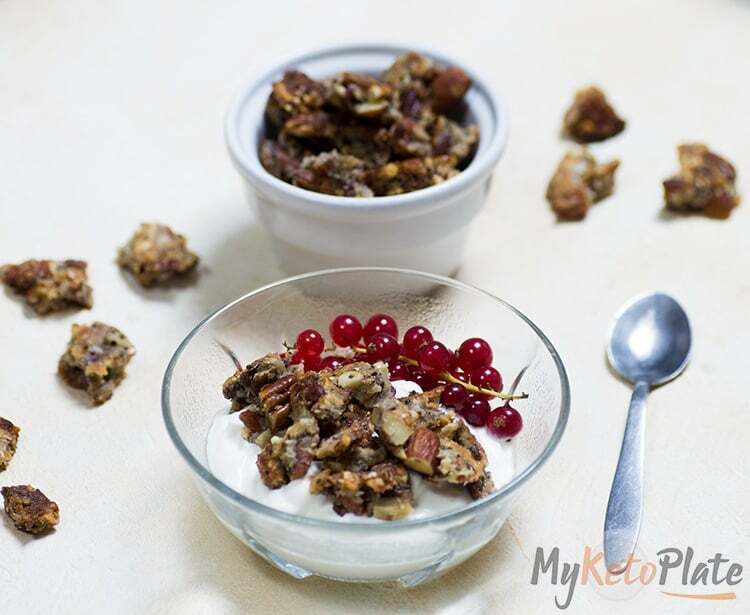 Perfect to pair with keto granola or berries for a quick delicious and filling breakfast. Being used to the low-fat yogurt for my breakfast, I thought I have to remove it from my life completely. 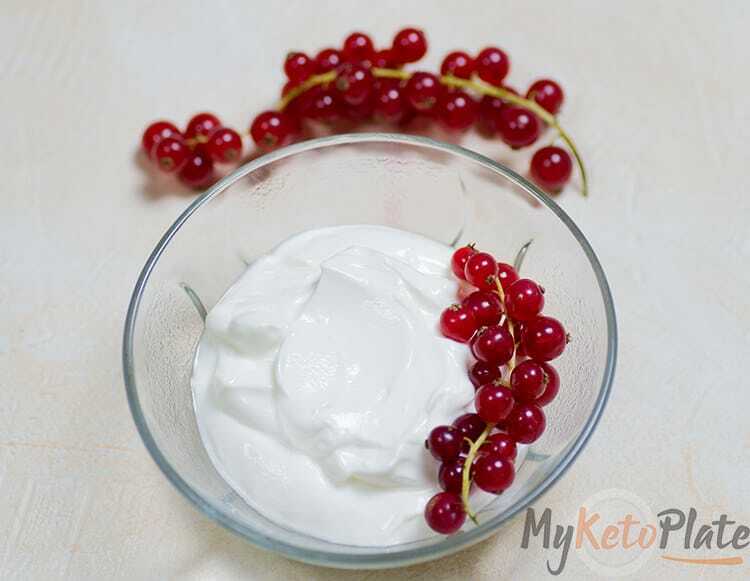 It all changed when by accident I discovered that I could make low carb yogurt in one minute with only two ingredients and maybe a sweetener of choice. I am a huge fan of yogurt because I think it is so versatile and easy to wrap any kind of recipes around it: dressings, smoothies, breakfast bowls, etc. As you may know, we avoid low-fat foods because when the producers take the fat out add something else. In this case, they add starches and sugar to make it taste better. That means that the carbs are higher in the low-fat products. Having too much added sugar from sources that we consider “healthy” is not what we want? There is a variety of low carb yogurts on the market claiming to be tasty but the ones I tried weren’t extraordinary good. Every bite had a strong chemical taste. Trying to eat whole foods here! So what I did next? I had an idea to make a low carb because my fridge was almost empty and my stomach wanted food. My recipe is extremely easy to make, tastes fantastic and I use it often. You’ll also need to add a keto-friendly sweetener. Use either a liquid form or a powdered sweetener because we want the final product to be slightly sweet and creamy. To make it flavored you can add 1 /2 teaspoon vanilla extract, cocoa powder or use flavored stevia instead of the classic one. 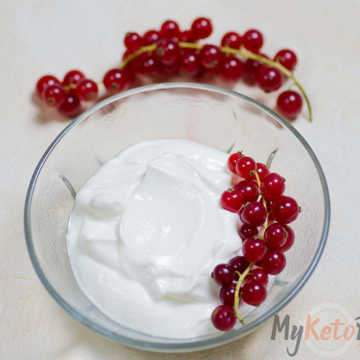 Serve the low carb yogurt with granola, or with nuts and seeds, or with low glycemic index fruits such as blackberries, currants, raspberries etc. A chia seeds jam is also one of my favorites things to add as a topping. Check out my recipe idea below and let me know what you think. Your feedback will help me improve the recipes. A super simple low carb yogurt recipe that needs only a few minutes to make and it's very versatile. Enjoy a creamy and smooth easy to make yogurt. In a bowl combine the sour cream, heavy whipping cream. Add sweetener little by little until it gets to the desired sweetness. Store it in the fridge, in a glass jar. If you make it with sour cream is it really yogurt with probiotics or is it creme fraiche? Just wondering. I’m sure I t’s delicious. I love yogurt and I’m struggling because all of the GOOD tasting yogurts are high in carbs. I’m going to try this. Hopefully, it will give me my yogurt fix. Those low sugar or sugar substitutes are just not good. With this I can use sucralose which is my non sugar sweetener of choice. It doesn’t have that lingering after taste that Stevia and others have. Thanks for sharing this.